Montezuma Quail is generally an uncommon to fairly common resident, but can be cyclical. There was a dramatic decline in 2010, a recovery was evident during 2013, and they were seen much more frequently in 2014 and 2015. Year round. Calling Montezuma Quail may be easier to detect in spring and summer, but they can be encountered any time of the year. 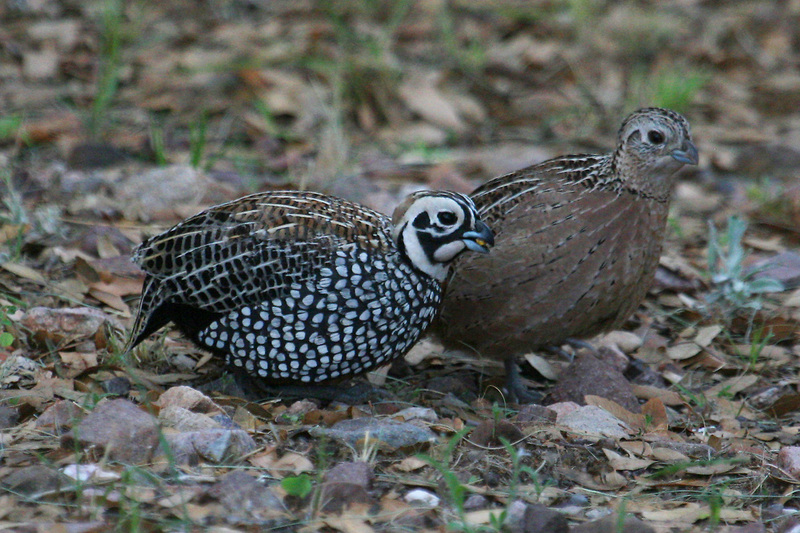 Montezuma Quail is also found at a few sites in New Mexico and Texas. Montezuma Quails prefer lower to mid-elevation grassland slopes, strewn with oaks, plus open oak woodland at mid elevation, and open mixed woodland canyons at higher elevations. They seem to prefer grass and short vegetation on the lower portions of slopes, up to 100 yards from the canyon bottom. 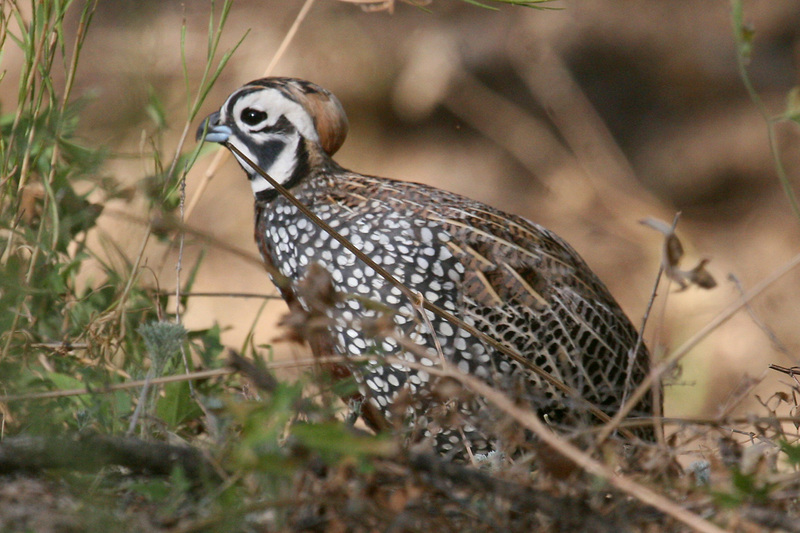 You might also find Montezuma Quail around rocks, bunch grasses, and thicker cover. From east to west, the main strongholds of Montezuma Quail in southeastern Arizona are: the Chiricahua Mountains, the Huachuca Mountains, the Patagonia Mountains, the Santa Rita Mountains, and the Atascosa Mountains/Pajarito Wilderness, along Ruby Road. Chiricahua Mountains: anywhere along any of the roads west of Portal, or any accessible habitat from mid to higher elevations. Anywhere in Cave Creek Canyon, the George Walker House and around Paradise, Southwestern Research Station, up to Rustler Park, Pinery Canyon, and Chiricahua National Monument. 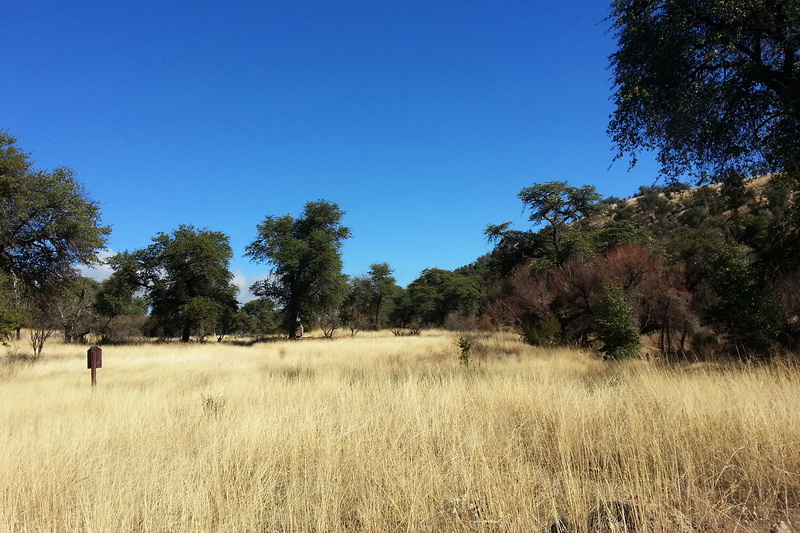 Huachuca Mountains: Ash, Miller, Ramsey, Garden and Huachuca Canyons, or any accessible habitat from lower grassland edges to high elevation clearings in mixed forest. Whetstone Mountains: French Joe Canyon and any other accessible, suitable sites. Las Cienegas & Surrounding Grasslands: the more hilly and wooded parts of Las Cienegas, Elgin, the San Rafael Valley, Appleton-Whittle Research Ranch, Parker Canyon Lake, and Canelo Hills. Patagonia Mountains: anywhere along Harshaw Rd and Harshaw Creek Rd in the mountains, and accessible side canyons. Sometimes along the Sonoita Creek corridor: along Blue Haven Rd, at the Patagonia-Sonoita Creek Preserve, Patagonia Roadside Rest, and Patagonia Lake. Santa Rita Mountains: mid to higher parts of Madera Canyon (above Proctor Road), Florida Canyon, Montosa Canyon, and any other accessible canyons in that habitat. 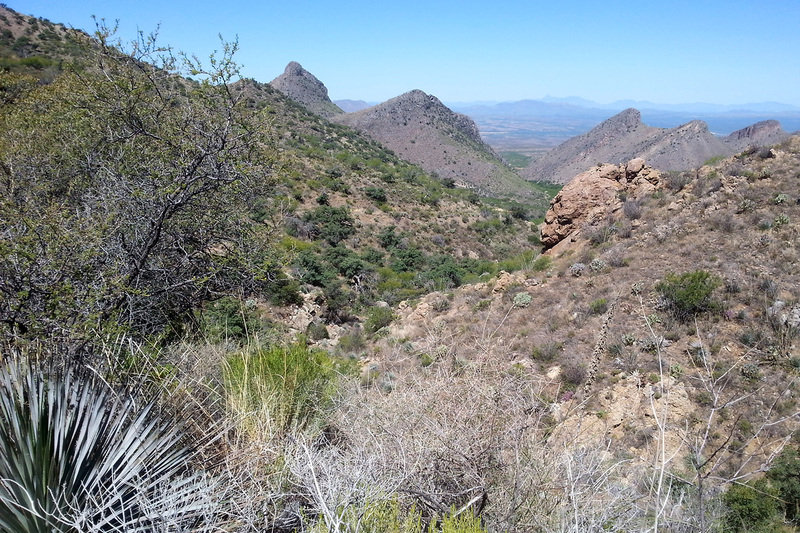 Atascosa Mountains/Pajarito Wilderness: anywhere along Ruby Rd from Rio Rico to Warsaw Canyon. Peña Blanca Lake and Canyon, Sycamore Canyon, Yank’s Canyon, California Gulch, Warsaw Canyon, Arivaca Lake. 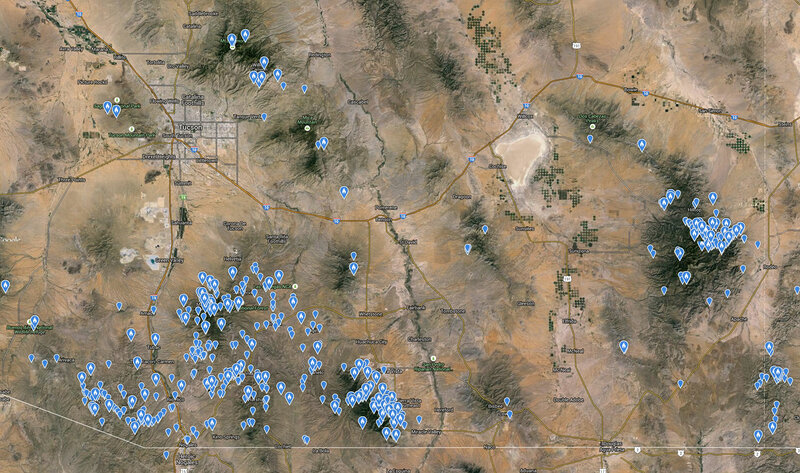 Also a few records every now and again in suitable habitat at: Beunos Aires, Tumacacori Mountains, San Cayetano Mountains, Tucson Mountains, Santa Catalina Mountains, Rincon Mountains, Pinaleño Mountains, Dragoon Mountains, Swisshelm Mountains, and Peloncillo Mountains. Montezuma Quail is a shy, elusive bird, and consequently can be very hard to detect, even in years when they are doing well. 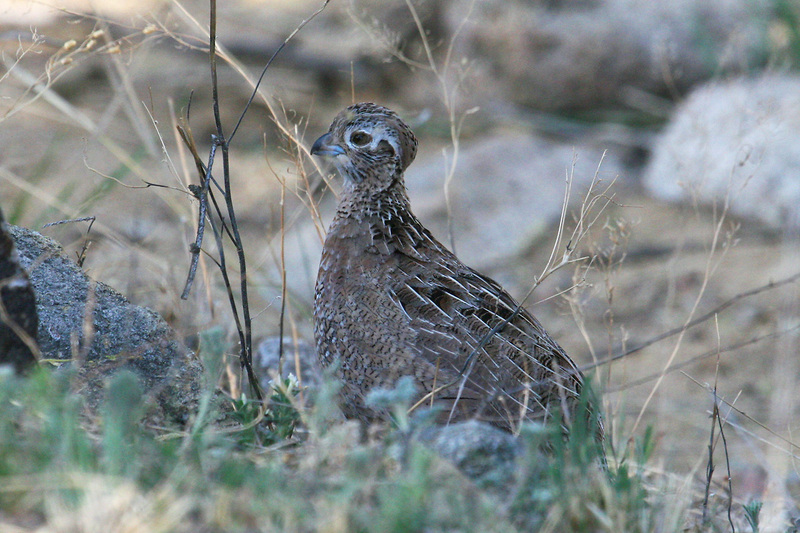 Unlike other local quail species, Montezuma Quail tend to freeze when approached or disturbed, creeping away through short vegetation and grass. Usually, they only flush from very short distance, just a few feet or, more often, immediately underfoot, giving the observer a very bad view and a fright! While they can be encountered anytime, the most likely time of day to find Montezuma Quail is the hour or two after dawn and the hour or two before dusk. One great way to see Montezuma Quail is from the car. Driving Ruby Rd west of Nogales, Harshaw Rd in the Patagonia Mountains, Carr Canyon in the Huachucas, or roads in the Chiricahuas at dawn and dusk gives you a decent chance of seeing a Montezuma Quail. Look for them crouched at the side of the road, like small rocks, or moving slowly through the grass. Rather than walking along the canyon bottom in likely habitat, walk along the slope, parallel to the canyon bottom or wash, maybe 20 yards up slope. 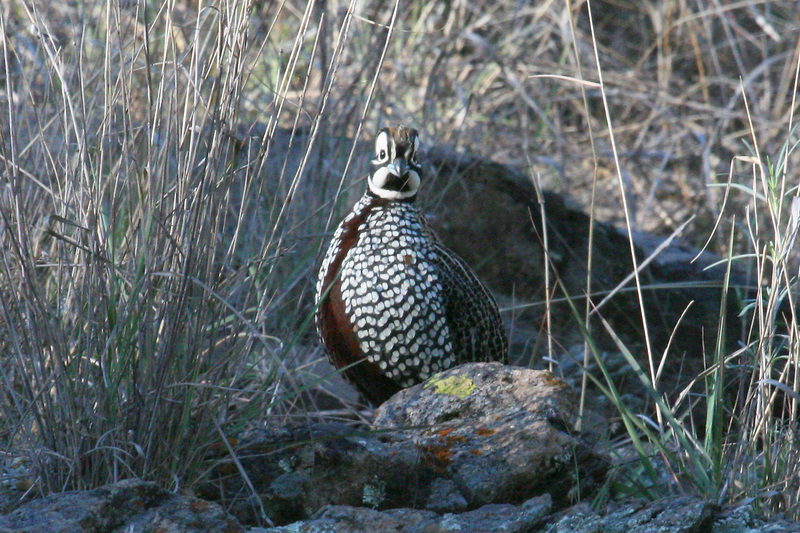 This will increase your chances of flushing Montezuma Quail from the lower slopes. Another good tactic to employ is being near a water source in the correct habitat, such as a stock pond, flowing creek, or seasonal pool, especially during the first hour of the day. For those that use playback, the female’s clear, 4-8 note downward whistle is attractive to the male Montezuma Quail, and may give better results in attracting one than playing the male’s down-slurred, weird, iconic, shivering buzz, although either call will attract Montezuma Quail to call back and maybe move closer.